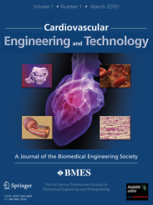 Cardiovascular Engineering and Technology (CVET) presents a wide spectrum of research, from basic to translational, in all aspects of cardiovascular physiology and medical treatment. It offers academic and industrial investigators a forum for the dissemination of research that utilizes engineering principles and methods to advance fundamental knowledge and technological solutions related to the cardiovascular system. Coverage ranges from subcellular to systems level topics, including,among others, implantable medical devices; hemodynamics and tissue biomechanics; functional imaging; surgical devices; electrophysiology; tissue engineering and regenerative medicine; diagnostic instruments; transport and delivery of biologics; and sensors.